I keep seeing so many wonderful cloches around blogland. It seems that everyone is decorating with them. I thought it would be fun to have a Cloche Party. Remember when we had the Target Birdies party. I am thinking the same thing. 1. Show us your cloches. 2. Where do you use them in your decorating. 3. What do you put inside them. 4. How many do you have. Just show us and tell us anything you want about your cloches, the shapes, the sizes, the colors and anything that draws you to them and why you like them. If you are interested let me know and if enough of you want to participate I will pick a date and set up Mr. Linky and then we can get the party going. This should be fun. Let me know. Hi Marty, this sounds like great fun. I only have one cloche....yikes and with all the stuff I own. If you start this, I will surely join. With my traveling of late...I feel so lost in blogland...but yes I would love to! OK Marty! That does it ... I am going to start my search for the perfect cloche and join the fun! What a great idea. I only have one myself. I've looked for them, but haven't added any more to my collection of one yet! I'd love to find some more. They became popular and now are snapped up so fast! Hey Marty! That sounds like fun! I love cloches! I only have one though! Let me know when you are having the party! Love your blog. Dang, I don't have a cloche. I've been wanting a couple though. Especially NOW! Sounds like fun! I just bought my first one and have yet to decorate it. This gets me motivated! I think it sounds like a great idea, Marty! And thanks for voting for my friend's picture! This sounds like so much fun, Marty. We're going home, Saturday. That's where all my cloches are. Can you believe I don't have a single cloche, here at the lake? I should do something about that!! I'd love to participate in a cloche party. I love them, but don't own a single one...I may need to do something about that. I would love to see all of the clever uses for cloches people have! Great idea! I would love to participate too but I don't have a cloche.....yet. Ohhh...a cloche party sound like grand fun!!! I'd love to participate...there's only one little bitty problem...I'm getting ready to go to Texas in about 3 wks...so I may not be here...unless you have it soon! 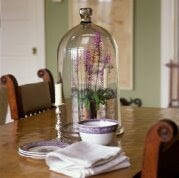 I do think it's a great idea and I'd love to see what and how everyone decorates their cloches!!! I just fell in love with your new little treasure finds!!! Hope that you're having a terrific Tuesday Sweetie! Hm... well, I don't have any cloches, but if I did I think it would be fun to show them off! This may be the push I need to join the cloche brigade! Hey Marty! I think a cloche party sounds great....I have several but right now mine aren't "at their best". I have a couple on my sideboard in the dining room with little bits of china in them but I'm trying to get inspired to do something different....this party could give me some great ideas. Let me know if you have it. I'll join, I'll join. What a great idea. So many of these memes are duplicated, but this is a true original idea. Ok, even if I don't find one, I'll definitely be looking at everyone's... Sounds exciting! sounds like fun to me. I have about 3-4. Can't stop getting them. So, count me in. And thanks for the nice comments on my kitchen redo on my blog..
Left you a little something,,,you always start my day with sunshine! I don't have one :-(, but I'll be on the look-out for one now :-)Great party idea, Marty!